A group of flowering plants found in marine or estuarine waters, that tend to develop extensive underwater meadows. Ocean Data Viewer A tool for easy access to a range of datasets that are important for the conservation of marine and coastal biodiversity. The data can be downloaded or viewed online. Seagrasses are a unique group of flowering plants that grow in the shallow coastal waters of most continents 1. Seagrasses can form vast aggregations, or meadows, which alter the flow of water, nutrient cycling and food web structure of the local environment 2. 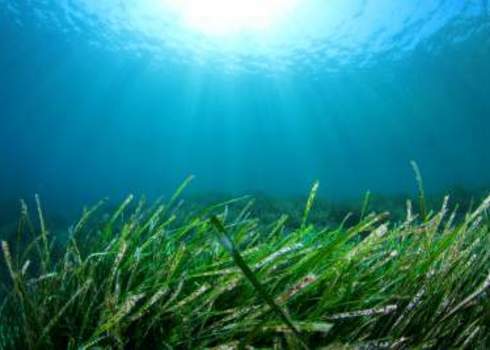 Seagrasses are broadly distributed in most of the world’s oceans and seas, including the Black and Caspian Seas. The global distribution of seagrasses extends up within the Arctic Circle, where they are present in northern Russia, Norway and Alaska. Seagrass has also been recorded as far south as New Zealand. Strong wave action, nutrient concentration, ice scouring, depth and water turbidity are some of the limiting factors to the distribution of seagrasses. Seagrasses have evolved the ability to grow completely submerged by seawater, and have an underwater pollination system. They are able to cope with saline water, and have rooting structures which allow them to withstand the movement of water. Seagrass meadows provide numerous ecological services, acting as essential habitat (e.g. spawning, nursery, refuge and foraging areas) for many animals, including commercially and recreationally important fish species 3, 4, whilst providing a major source of food for a range of large herbivores such as the Endangered green sea turtle (Chelonia mydas), and Vulnerable dugongs and manatees 5, 6. Furthermore, the benefits provided by a healthy seagrass meadow extends beyond the local area, through exporting key nutrients (e.g. nitrogen and phosphate) and organic carbon to other parts of the oceans, including some to the deep-sea where they provide a critical supply of organic matter in an extremely food-limited environment 7. Much of the excess organic carbon produced is buried within the seagrass sediments, making seagrass habitat an important blue carbon habitat. Seagrass meadows are one of the three ‘blue carbon’ habitats because of their carbon storage capability 10. In addition to their value as a nursery and refuge for important fish species, seagrass meadows modify currents and waves, and trap and store sediments and nutrients, acting as a filter for coastal waters. They have an economic value attributed to such services estimated at US$ 34,000 ha-1yr-1, a figure greater than many terrestrial and marine habitats 11. As outlined above, these habitats are of great importance for a range of reasons, and as such are recommended to be included in regional marine conservation priorities, e.g. in the Indo-Pacific 12. Seagrass habitats help stabilise the marine sediment and provide a framework for the accumulation of more sediment and other materials 9. Seagrasses and the associated ecosystem services they provide are, however, under direct threat from a host of anthropogenic factors. A synthesis of 215 published studies showed that seagrass habitat has disappeared worldwide at a rate of 110 km2yr-1 between 1980 and 2006 11. Of the 72 seagrass species listed in the IUCN Red List of Threatened Species, three are Endangered 6, 11. As seagrasses require some of the highest light levels of any plant group worldwide, the primary threat is loss of water clarity and quality, often brought about by eutrophication and sediment loading stemming from reclamation, shoreline hardening, and dredging within coastal regions 7. Additionally, seagrass meadows are threatened by a multitude of environmental factors that are currently changing or will change in the future including rising sea levels, changing tidal regimes, UV radiation damage, sediment oxygen depletion and deprivation, increases in sea temperatures and increases in the occurrence of storm and flooding events 13.
den Hartog, C. The Sea-grasses of the World. Volume 59. Issues 1-4. 275pp. North Holland Publishing Company, Amsterdam (1970). Hemminga, M. A. & Duarte, C. M. Seagrass Ecology. (Cambridge University Press, 2000). Watson, R., Coles, R. & Lee Long, W. Simulation estimates of annual yield and landed value for commercial penaeid prawns from a tropical seagrass habitat, Northern Queensland, Australia. Mar. Freshw. Res. 44, 211–219 (1996). De la Torre-Castro, M. & Rönnbäck, P. Links between humans and seagrasses—an example from tropical East Africa. Ocean Coast. Manag. 47, 361–387 (2004). IUCN. The IUCN Red List of Threatened Species. Orth, R. J. et al. A Global Crisis for Seagrass Ecosystems. Bioscience 56, 987 (2006). Keith, D. A. et al. Scientific foundations for an IUCN Red List of ecosystems. PLoS One 8, e62111 (2013). Jackson, J. B. What was natural in the coastal oceans? Proc. Natl. Acad. Sci. U. S. A. 98, 5411–5418 (2001). Nellemann, C. et al. Blue carbon: A Rapid Response Assessment. Environment 71 pp. (United Nations Environment Programme, GRID-Arendal, www.grida.no, 2009). Short, F. T. et al. Extinction risk assessment of the world’s seagrass species. Biol. Conserv. 144, 1961–1971 (2011). Unsworth, R. K. F. & Cullen, L. C. Recognising the necessity for Indo-Pacific seagrass conservation. Conserv. Lett. 3, 63–73 (2010). Björk, M., Short, F., McLeod, E. & Beer, S. Managing Seagrasses for Resilience to Climate Change. IUCN, Gland, Switzerland. 56pp. (2008).